In October of 1918, a group of civic minded community members founded the Tacoma Chapter of the Drama League of America (known as the "Tacoma Drama League" or sometimes as the "Civic Drama League"). The Drama League of America sought to promote theater and the study of theatrical literature and culture as a means of community building as well as individual enrichment. Many such chapters were started across the United States. 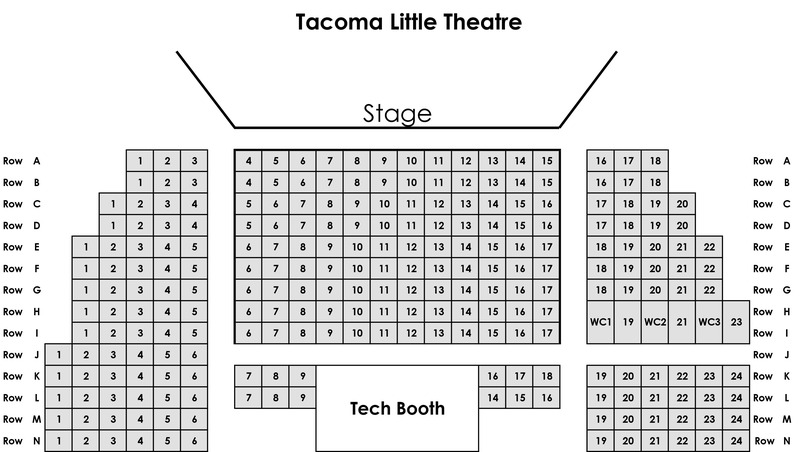 The Tacoma Chapter was comprised of the Civic Drama School and the Tacoma Little Theatre (TLT). The Drama League provided oversight, governance, and promoted the two subsidiary wings. While TLT's first fully realized production was not until December of 1919, a production of G B Shaw's You Never Can Tell, The time from 1918 to 1919 was filled with classes, play reading and study. That commitment has been the hallmark of TLT's history. While some gaps maybe found in its production history for various reasons including the Great Depression and World War II, records show that organizational activity has never ceased since those early days in 1918. Today, TLT is the surviving entity of the original three. As such, it has inherited the responsibilities and goals of all three: Governance, Promotion, Education, and Production. TLT is governed by a volunteer Board of Directors, and is managed by a small professional staff. TLT hires professional directors and contracts designers and other production leadership positions from among those with professional or other significant experience. The actors, crew, ushers, and all other theater functions are accomplished by over 250 volunteers from a four county area giving over 10,000 volunteer hours a year to provide their friends, family, neighbors, co-workers and community with some of the best amateur theater this area has to offer. This puts Tacoma Little Theatre among the largest volunteer driven organizations in Pierce County. One of TLT's first performance venue's was The First Congregational Church at 209 South J Street. Among the productions presented in the early years (1930) was a controversial play by Eugene O'Neil: Emperor Jones, an early twentieth century indictment of slavery and enslavement. Among the principle players in that production was one Morris Ankrum, who went on to a have a long career as a supporting actor in many Hollywood motion pictures from the 1940's through the early 1960's. The original structure of TLT's facility at 210 North I Street was built in 1913 to repair automobiles. The business was expanded and became Tacoma Motors until the property was purchased by the Tacoma Drama League in 1940. The first performance in the "new" facility at 210 North I Street was Maxwell Anderson's Knickerbocker Holiday, which was also the first musical production presented by TLT. TLT's turntable was installed during the 1940's using surplus parts from a U.S. Army railroad roundhouse. While much of the early hardware has been replaced over the years, TLT maintains its 32' motorized turntable as a unique feature of the stage to this day.